This topic is the third lesson of MIT App Inventor IoT (Internet of Things) tutorials. We are going to introduce how to use your Android phone to continuously read Arduino 101's analog pin(A0) via App Inventor's BluetoothLE (Bluetooth 4.0 Low Energy)component. Arduino 101 is the latest dev board under cooperation between Arduino.cc and Intel, which is named as Genuino 101 out side USA. 1. Android phone (Must have BLE hardware, but I think it's not a problem for most Android devices today). 3. 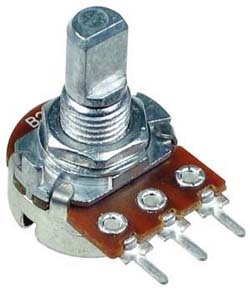 Potentiometer (or other similar analog input component you have). Take potentiometer for example, please connect the central pin to Arduino 101's A0 analog pin. Other two pins are connected to Arduino 101's 5V and GND pins. Please note that potentiometer is a non-polarity components therefore the difference you connect the right-hand side pin to Arduino 101's 5V or GND pin is that you get the readings increasing/decreasing when you turn the knob CW. This example will continuously reading Arduino'101 analog A0 pin, and update Label and Slider accordingly. This example had used 3 Clock components, and their TimerInterval are found after several tests, you may need to adjust them according to the real situation. Since different protocol, you can not use old BluetoothClient component to talk with Arduino 101. For simplicity, this project connect to your Arduino 101 directly, which means the Bluetooth address is assigned in the code. If your app has to connect from several devices, I think pairing with these devices first and pick them by ListPicker component in App Inventor is a better solution. There is only BTList which is enabled when you first open the app. Please click BTList, it will show all paired Bluetooth devices on your phone. Please click the name of your module, it should take 1~2 seconds to connect and back the main screen. You can see that the [LED Turn On] button is now clickable and the module's LED is keep lighted up. Just click the button, the LED on Arduino will light up and the button's text will become "LED Turn Off". Click again will turn off the LED and switch back the button text. Please click the [Disconnect] button when you don't want to play anymore, this will disconnect the connection of your phone and bluetooth module and the module's LED will flashing again. While initializing(Screen1.Initializing event), BluetoothLE1 component will scan for avalible devices, which means your Arduino 101 should be ready by then. When you click the ConnectButton (Button_Connect.Click event), BluetoothLE1 component will try to connect the specified device, we put our Arduino 101's bluetooth address here (98:4F…), please modify this string according to your Arduino 101's. BluetoothLE1.connected event will be called after the connection is established, we show a message on Screen's titlebar. It's quite useful for display some shor messages. Clock1 component can tell whether it had already connected with an Arduino 101 by disconnect variable value. If it is true, the App Inventor will further check if there was a connection, if connected then cut off connection(BluetoothLE.DisconnectWithAddress), otherwise then start scanning BLE devices (BluetoothLE.StartScanning). On the other hand, if disconnect variable value is false, then App Inventor will start to combine two variables (data1 and data2) to get real analog pin status. But first you need to enable the Timer event of Clock2 and Clock3. Clock2 will disable the Timer event of itsefl and Clock3's every 0.9 second, then re-activate the timer event according to the value of disconnect . Clock3 will control how to read a integer from Arduino 101(BluetoothLE.ReadIntValue) according to status variable(0 or 1). Then assign the result of BluetoothLE.IntGattValue to data variable, if the value of data is within 128~256, then minus 128 from it before assigning to data2. However, if data is less than 128, them assign data to data1, we will combine it in Clock1.Timer event. service_uuid and characteristic_uuid are also specified in the sketch as “19B10011-E8F2-537E-4F6C-D104768A1214″, which must be the same with the string you use in App Inventor. When click Button_Disconnect, we will set disconnect varaible to true, which will trigger BluetoothLE.DisconnectWithAddress)in Clock1.Timer event (STEP3). Copy the code and paste it onto Arduino 101. Please notice that Arduino 101 has onboard BLE hardware, therefore you don't need to connect other Bluetooth modules such as HC05.